What if I told you to stop trying to reach every potential customer with your marketing – to limit your scope and narrow your focus? Sounds crazy, right? But this is exactly what small to medium-sized B2B companies need to do. While many companies try to be all things to all people, that goes against the very grain of B2B, where customers expect a high level of product customization to fit their exact needs. Marketing to these customers requires customization, as well. But how do you realistically custom tailor your marketing and deliver targeted messages that speak to the buyers you need to reach – especially when most B2B sales involve many different buyers? Develop buyer personas. Buyer personas are generalized descriptions of your ideal customers. Your personas don’t have to be elaborate, and they can usually be developed within a one-hour workshop. Many B2B companies can identify at least 10 different customer types, but it’s important to narrow the focus to less than a handful. Why? Most companies simply don’t have the resources to market to more than three or four buyer personas. As you grow and take on more resources, then you can start looking at marketing to more. When developing personas, you need to always keep in mind that buying typically involves multiple decision makers with different functions and at different seniority levels. This impacts marketing programs, because different tactics and messages are needed to address different stakeholders. Company websites, blogs and articles, for example, are important avenues for reaching the junior person tasked with researching solutions, but activities like networking and speaking engagements are important to raise awareness and achieve credibility in the eyes of the senior decision maker. Buying behavior can be completely different between senior executives and junior employees, and both of them (and others) are likely involved in the buying process. Successful B2B marketers get to know the personas for the different individuals involved in purchasing decisions so that they can tailor marketing materials to their different needs. Personas also ensure that the entire extended marketing team, from freelance content writers to graphic designers, understands the target customers in order to reach them more effectively. It’s not enough to know which buyer personas to target, you also need to understand how they buy and what they need along the way. Understanding buyer needs is the most important go-to-market strategy for 69% of B2B marketers.2 If you ask me, that number should be closer to 100%. In fact, it’s imperative that your entire company has an intimate knowledge of how your customers buy. Who is involved in making the decision to buy the product or service? Is it a single person, an organized committee, an informal group? What process is being used to make the buying decision? Is it ad-hoc or RFP? What are the criteria used for selecting a vendor? Is it reputation, relationships, technical knowledge, product strength, a mix of these? What is the typical timeline for making the decision to purchase? Is it 1 day, 1 week, 1 month, 1 year, several years? It’s important to familiarize yourself with the typical path to purchase for your products and build your buyer personas before you create your marketing strategy or build your tactical plan. Companies that get this right are on their way to generating more valuable leads, driving sales and increasing revenues. 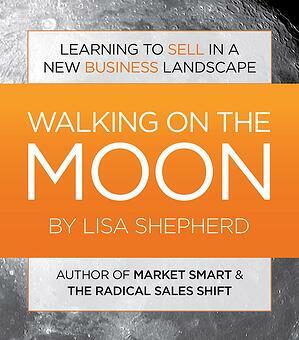 If you want to follow a fictional B2B company’s journey to understanding new buyer behaviours in today’s business landscape, read my latest book, Walking On The Moon, here. It also comes with a practical guide to creating your own buyer personas quickly and painlessly. And if you’re still struggling with understanding your buyers and how to successfully market to them, let’s talk.